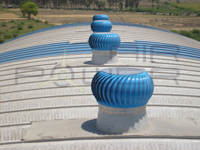 Air Ventilator, Air Ventilators, Ventilators, Ventilator manufacturer in Gujarat, India. Note : Available in Aluminum, Stainless Steel, Powder Coating / Anodizing will be on request. Air Power Ventilator's vane are manufactured from high grade aluminium including the rivets and therefore highly resistant to atmoshperic corrosion. No power involved for its operation as its movement is controled by natura wind movement / hot air draft (Thermos Syphoning). The vane's are profiled and rolled to provide strong blade with good aerodynamic performances. 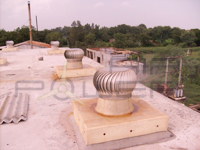 Air Power Ventilators are light in weight and hence operational at very lightly wind speeds. Since no power involved for its operations, no recurring charges in terms of electricity. The vane design and the centrifugal action prevent rain water from entering the ventilator. Designed to be fitted easily on asbestos, galvanized, iron and aluminium roofs.Assured ventilation for 24 hours / 65 days. 4. Select Air Change Rate from. Table A. 5. Select Exhaust Capacity from Table B as per required Temp. Diff. C and wind- Velocity (MPH). Available Stainless Steel and Powder Coated Model. 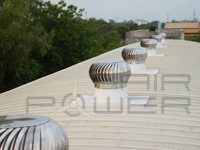 Natural Eco Ventilator, Wind Driven Turbo Ventilators, Warehouse Ventilators, FRP Wind Ventilator, Roof Extractors, Roof Top Extractors, Roof Air Ventilators manufacturer, Ahmedabad, Gujarat, India.